Released: March 1982 as a semi-official bootleg cassette (Live In London 1980); November 1996 on CD (The Legendary Chaos Tape). EDIT: After I’d published YMGTA #11 (Perverted By Language) it was pointed out to me that in December 2018, the Set Of Ten box set was released, which includes three recordings that predate PBL. One of the discs contains a recording from Thursday 20 November 1980 at the Cedar Ballroom, Birmingham, which obviously fits in here. It’s an okay if not particularly remarkable audience recording, but for the sake of completion (and to assuage my OCD) I thought I’d better add a note. It’ll be included in the rankings from YMGTA #12 onwards. Between Grotesque‘s release and the Acklam Hall gigs, the most newsworthy event was the shooting of John Lennon on 8 December. The day of the second date, The Clash released their sprawling triple album Sandinista! On the night of the first Acklam Hall gig, Top of the Pops featured Adam & The Ants performing Ant Music, Queen’s Flash and St. Winifred’s School Choir’s epic black metal/grindcore classic There’s No-One Quite Like Grandma. Here‘s the 30-11 chart rundown. The original Chaos Tapes cassette release was limited to 4000 copies. 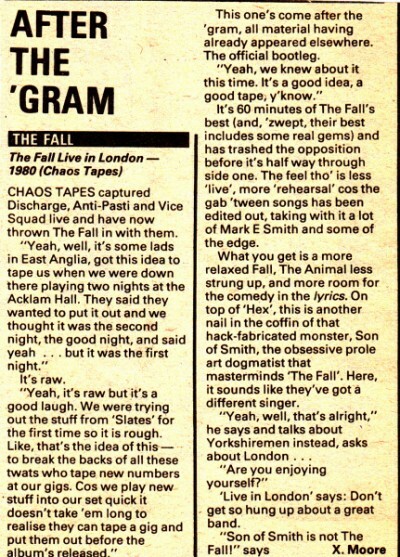 In a 1982 NME interview1, Smith said that he’d okayed the release, believing it to be a recording of the second (December 12) night – ‘the good night’ – although it was in fact a recording of the gig on the 11th. Despite the dubious sound quality, it sold out quickly, Fall live recordings being a distinctly less frequent occurrence than was to be the case in later years. It reached number seven on the independent chart, and was on the chart for ten weeks. The group (as attested by Steve Hanley and several others) were never very big on rehearsals; the live stage was their rehearsal room, songs often being tried out in gigs in various forms before emerging on a studio release. This was obviously already becoming obvious to Fall fans, who, according to MES, didn’t take long ‘to realise they can tape a gig and put them out before the album’s released’2. Thus, according to Smith, the aim of this release was ‘to break the back of all these twats who tape our new numbers at gigs’3. In typical Fall style, the group open a gig a month after the release of their new album with a song that they haven’t even recorded yet. Whilst musically what was to be released on Slates is already in place, there’s quite a bit of variation in the lyrics: ‘The son of Mike Parkinson, made from coal… we lost one of our lads today… he was from Lancashire’. Remarkably smooth and well executed considering that it was only the song’s second outing live. 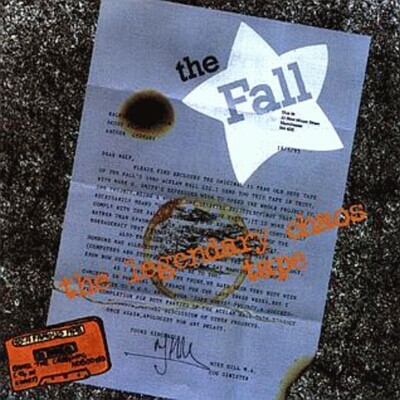 Apart from the use of ‘We are The Fall’ it has very little to do with Crap Rap. MES sounds quite jolly. A lively enough run through what is, to my mind, not one of their strongest songs. MES still sounding quite upbeat and engaged. The 12th outing for NFIH sees the group lock into the loose, ramshackle groove with enthusiasm. Is this where they invented ‘baggy’? MES continues to sound enthusiastic and expansive, plus this take sees possibly the best use of the kazoo we’ve heard thus far. I quite like this tune, but it sounds awfully out of place here. It has an entertainingly tongue -in-cheek atmosphere, but it still feels rather incongruous. They’ve moved on from this sort of thing, by some distance. The variable (at best) sound quality on this album suits quiet, understated songs like this the best. It’s not a personal favourite, but the sparseness of the sound is quite effective here. It’s atmospheric, although MES’s ventures into falsetto are almost a little uncomfortable in places. A cracking version. Driving and intense, even if it’s a little ragged in places. MES gets a bit ‘squawky’ at times – he was clearly still in enthusiastic mode. Lovely intense ending. Much as I love this song, it sounds a bit weak here. The sonic barrage that makes the studio version so wonderfully overwhelming is missing and it’s all a bit thin and hesitant. To be fair, this is clearly more to do with the recording than the group’s performance. This is much better: a rollicking version, featuring some lovely country/blues guitar fills. It would be another nine months before the group recorded this, and over a year until its release on Hex, but on this (its eighth live outing) it sounds fully formed, very close to the final studio version. Another energetic version, and MES sounding once again in enthusiastic and jaunty mood; lots of squawks, squeaks and grunts, plus a little laugh at 0:36. Only its fifth outing, and again it’s not a million miles away from the final studio version that would be recorded a couple of months, although it’s ever so slightly sluggish in comparison. MES continues to be in expressive and almost playful form (listen to 3:53-3:59 especially). Obviously, I’m always happy to hear a nine minute version of SvR. Like Older Lover, it’s actually well suited by the variable sound quality: the thinness of the guitar sound gives it a spindly, spidery quality that adds to the creepy atmosphere. The occasional swathes of heavy reverb on Smith’s voice (0:41-0:44 and 6:30-6:41) are not exactly subtle but are still an intriguing feature; the verging-on-tuneless keyboards add to the demonic carnival tone. It’s a fine version of a great song. Another energetic scamper through a Grotesque track. The vocal reverb makes a brief return at during the second half, and MES improvises a few lines about Warren Mitchell and Dexy’s Midnight Runners. Smith sounds uncharacteristically hesitant in his intro: ‘This, um, this one… isn’t… what you think it is. It’s just… it finishes off the applause’, although he rounds it off with a sardonic little laugh and a bit of playful falsetto. It’s another one where the dodgy quality adds something, the background noise contributing a drone-ish hum that again fits well with the dark, malevolent tone. One of the striking things about this recording is how the group, just three weeks after their new album’s release, perform a set where less than half the songs come from Grotesque (and only two out of fourteen pre-date it). Their confidence in performing the newer material is understandable though, when Jawbone, Slags, etc. sound so fully realised and powerful already. 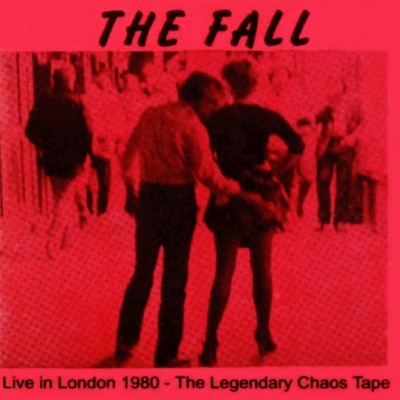 Anyone who followed the Fall in Fives blog from its early days will be aware that I have been slightly dismissive about Fall live albums in the past. What has changed, I think, is that the process of analysing the back catalogue in a chronological fashion leads you into appreciating individual song’s development through listening to the various contemporary performances. Let’s not get carried away though; in the Fall 10CD box set I recently posted on the Fi5 blog, only one live track (Blindness) featured in 168 tracks. I don’t think that any of the live albums are going to start replacing my ‘regular ‘ Fall listening, and I’m not about to become an obsessive bootleg collector. But I have come to appreciate the broadened understanding of the group’s development that comes from listening to the live recordings. Well, some of them anyway; and this one is definitely a positive example. 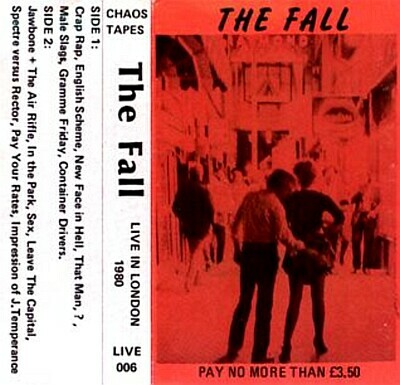 As well as a couple of other reissues with the same track listing, the album was reissued as Live In London 1980 – The Legendary Chaos Tape on Castle/Sanctuary in 2004 with three bonus tracks: Cary Grant’s Wedding, Totally Wired and The N.W.R.A. 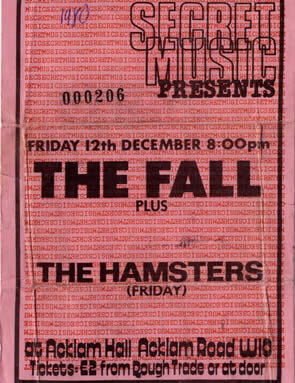 These three come from a London date in November 1980, although it’s not clear from which exact date. The version of CG’sW is rather untidy, but includes some interesting lyrical departures, referencing Yoko Ono and featuring the intriguing line, ‘And if I have a preference/for Cary Grant/slaughterer of innocents/add on thirty years/and you’ve got Mark E Smith’. It’s a spirited, if unremarkable blast through Wired. NWRA deploys a bit of the heavy reverb on the vocals as described above, and features a reference to ‘a version of Totally Wired by the Radio Two orchestra’. Nothing to add albums/singles-wise, obviously. But based on the sheer quality of the performances and the positive energy that emanates from Smith and the group, The Legendary Chaos Tape / Live In London 1980 goes to the top of the live albums list so far.